Another of the unique features available only available within GALENA is BackAnalysis. This feature is regarded by our users in glowing terms of: "...BackAnalysis really gives us a full appreciation of the situations we are modelling..." and "...BackAnalysis is going to save us so much time...". GALENA's BackAnalysis function takes the trial and error out of determining material and support requirements. It can be used for both backanalysis of past failures and for design of existing slopes, and answers the question of 'What strength is required? ', rather than 'What is the stability of the slope?'. BackAnalyses can be undertaken on any model using any of the methods of analysis available in GALENA - you can specify a single or multiple BackAnalysis. 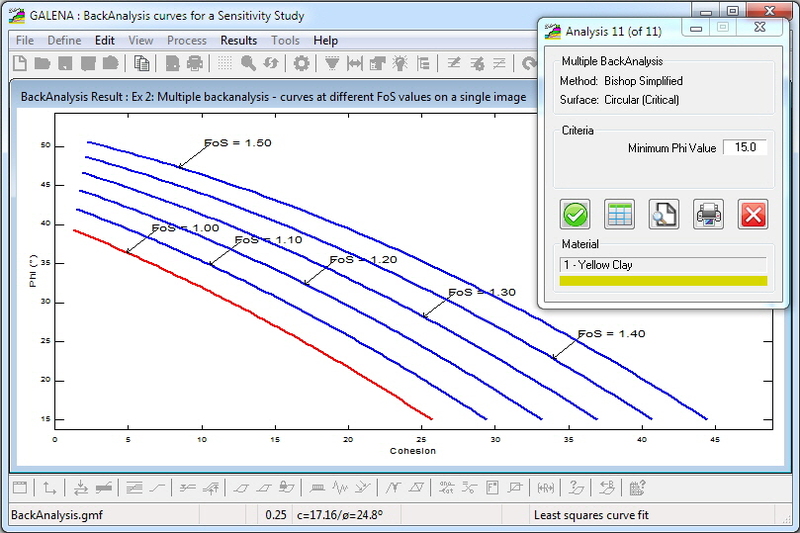 For a single BackAnalysis you define one Factor of Safety; for a multiple BackAnalysis you define up to ten different Factors of Safety - a curve will be calculated and displayed for each Factor of Safety defined, it's that easy! With GALENA's BackAnalysis function you can see at a glance the likely range of material properties over a given Factor of Safety range. The image below shows the results of a Multiple BackAnalysis. Each curve is individually (and automatically) labelled with its relevant Factor of Safety.